Your dog has been with you through it all, so it’s important to understand how you can take the best care of your dog in their golden years. Here are a few tips on looking after your loyal friend. How Well is Your Dog Ageing? All dogs are different and life expectancy varies by breed along with many other factors. Although you know how old your dog is, it might be more difficult to know how well they are ageing. Vets will look at a dog's physiological condition. They find that most dogs begin to show signs of ageing at around seven years for small or medium breeds and around five years for large and giant breeds. The tell-tale signs may include a dull or dry coat, flaky skin, joint stiffness, energy loss, weight gain, increased water intake, digestive problems or loss of muscle. While genetics and environment play a large role in how quickly your dog will age, you can still have a huge impact on their health. By feeding a high quality dog food, tailored to their needs at this life stage, you can help keep them in optimal body condition. Dogs of all ages need the same core ingredients in their food, but as they age they need different quantities of certain ingredients to support their health needs. The age at which your dog reaches 'mature' or 'senior' age will largely depend on the size of their breed but, as a rough guide, a dog is considered mature at 7 years old and senior at 9 years old and over. High Quality Protein: Much of your dog's food should be made up of protein. Make sure it comes from an animal source like chicken, for example, rather than a vegetable. Protein is critical because it's used by the body to build and maintain muscle. Fat: Choose a food with at least 10 percent fat in it. This promotes healthy skin and coat; it also provides the body's essential fatty-acid requirements. Never eliminate fat completely. Fibre: Pick a brand that offers no more than 5 percent fibre. This helps to support a healthy gut and encourages your dog to absorb vital nutrients by promoting digestive health. Antioxidants: These clever molecules protect the immune system by ridding the body of free radicals, which corrupt cell membranes and DNA. As dogs age, many are less interested in eating. They might not be burning the same amount of energy, so their appetite naturally decreases. There can be lots of reasons for a loss of appetite, such as mouth or tooth problems, so if your dog’s behaviour changes suddenly it’s best to get a vet to check it out. The key to feeding your senior dog well is to find a nutrient-packed food that your dog enjoys. Look for a food that will help minimise the stress on joints, and take care of teeth and digestion. Because ageing dogs generally eat less than their younger canine friends, it could be helpful to divide up their meals into two or three meals. Try a morning and evening schedule or a traditional breakfast, lunch and dinner. By feeding only at certain times, the food in the dish isn't so overwhelming, plus it’s likely to be fresher and more appealing. Timed feedings have the added benefit of increasing metabolism, which will help your dog maintain an ideal weight. 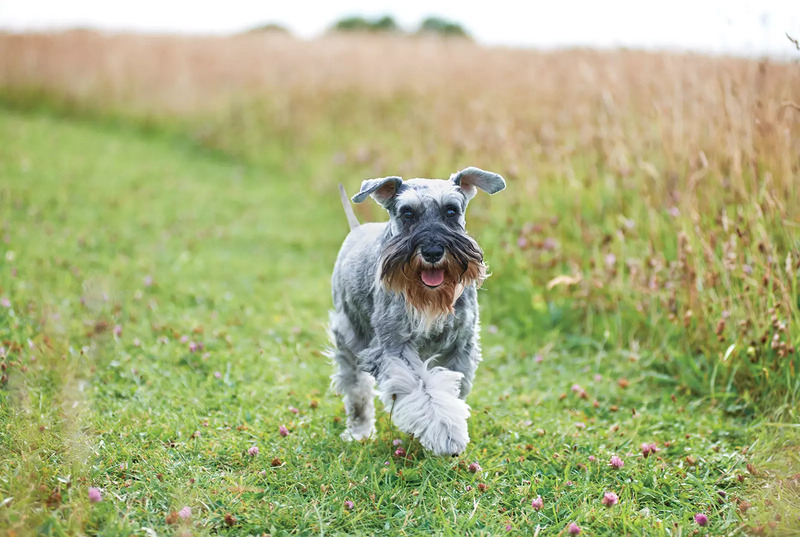 While the calendar might say that your dog is ready for retirement, their body needn't be. At EUKANUBA we’ve conducted an extensive observation with real dogs showing that our exceptional nutrition, alongside appropriate care, can help dogs live longer than their breed’s typical lifespan*. By feeding a diet of food specially formulated for your dog’s life stage, you'll help keep them feeling young. After all, there's a lot of life yet to be lived. * Exceptional longevity in Labradors (15.6 years) is defined as living +30% longer than the breed´s typical life span of 12 years.